Experience the life-changing benefits of our methods at an unbeatable intro rate to see if we’re a fit. Get individualized instruction via state-of-the-art equipment in a non-intimidating environment: it’s the core — pun intended — of what we do. Each of our clients receives this experience (and a killer workout) with every expert-led session — and new clients get to take the ECP difference for a test drive. What will my intro session be like? Only you and your instructor will be working together in our exclusive space, carefully designed for physical + mental clarity. We stand by a clear philosophy: Your body, your needs, your results. Each session is tailored to your fitness goals, abilities, past injuries and unique situation. This is Pilates for all. 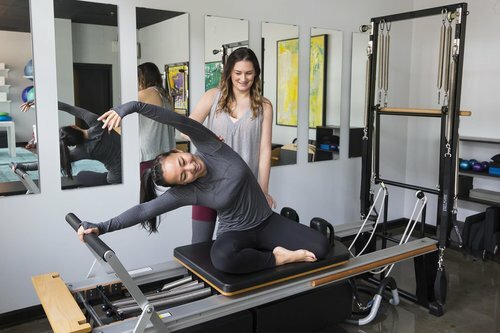 The STOTT Pilates Reformer ensures exceptional, safe workouts. Under the guidance of balanced and passionate trainers, our industry-leading equipment and tools catalyze real results. We aim for everyone who enters our space to leave with a sense of progress and self-worth, hungry to continue their Pilates journey. We provide you the knowledge and instruction to understand exactly what your core muscles are and how they work. This information will help you perform each movement with precision, aiding in the elimination of chronic pain. Just by signing up for the NCS, you’ll receive a postural analysis. The results will inform us which of your muscles need straightening, and which ones needs lengthening, so we can bring your body into perfect, balanced alignment. Our Certified Pilates Instructors will ensure the proper execution of each exercise. We want you to experience all the benefits of your efforts, and when you practice wrong form, all you gain are bad habits and inevitable injuries. Flexibility is the unsung hero of fitness maintenance, so we’re going to stretch, stretch, and stretch some more! If you can’t touch your toes, clasp your hands behind your back, or bend forward at the waist without bending your knees, all of that is about to change. Our instructors are knowledgeable, empathetic, and enthusiastic about creating a plan, just for you. They can provide modifications for bulging discs, osteoporosis, pregnancy, and many other restrictive conditions. As you contemplate the next step in your fitness journey, get our guide to the world of Pilates. Learn at-home exercises, basic anatomy terms and enter your first session confident and strong.